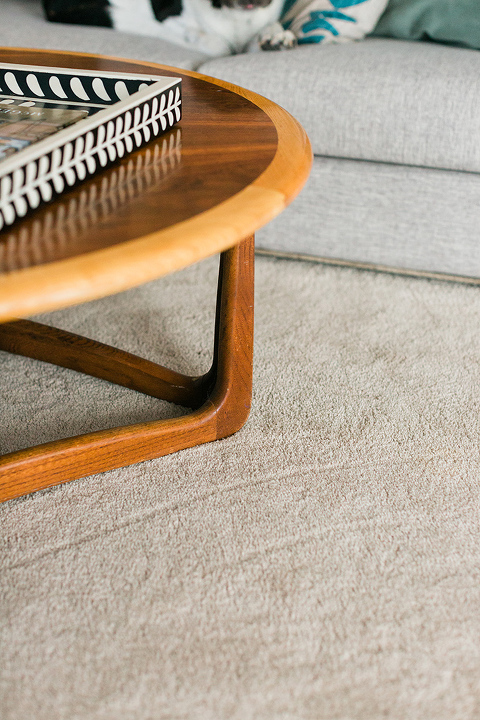 Ever since adding a sectional to our family room, I’ve had my heart set on a round coffee table. 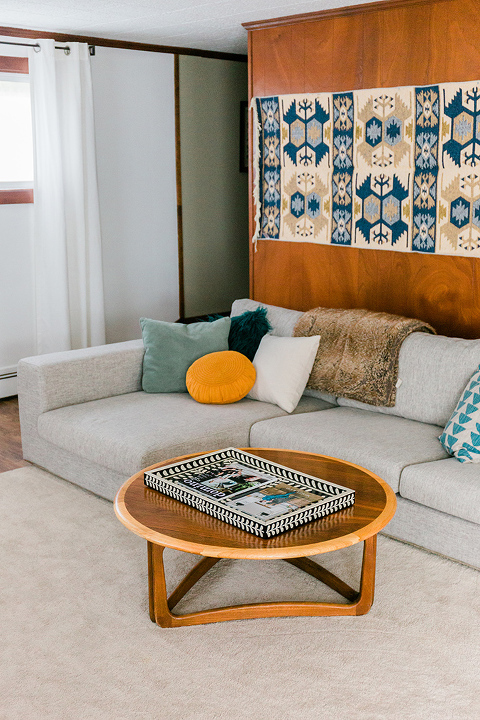 I just felt like something round would suit the L-shaped couch so much better than a rectangular one because we could scoot around it easier when we wanted to have a seat on the sectional. The problem was that we were already using a rectangular ottoman as a coffee table, and I was having a lot of trouble convincing John that we needed to get rid of it. The ottoman was in fine shape, but I still felt like the space could look and function better with something different. After months and months of dropping hints, I finally figured out a solution. I was able to “get rid of” the ottoman simply by moving it into the room that John uses to tie flies and listen to music. That way he gained the perfect spot to lounge and read his fly fishing magazines, and I now had a blank spot for a new coffee table—win, win! 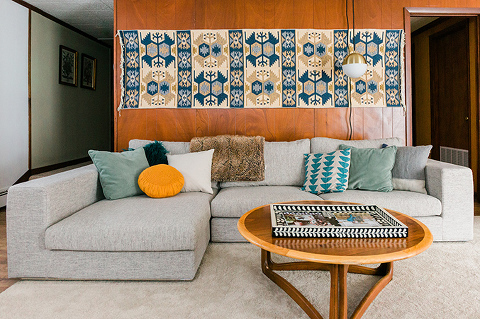 As you probably already gathered from the post title and photos, I ended up finding the perfect new-to-us vintage coffee table for the room. It came from a semi-local antique store (in neighboring Staunton, Virginia), and cost $135. I had actually gone to the store planning to purchase a different retro round coffee table that had been in the lower level of the shop for over a year. I remembered seeing it there ages ago, and thinking back then that it could be just right for the family room. I couldn’t recall the price, but I thought it was something like $125. When I finally got to the antique shop and was able to take a closer look at the price tag, though, I found out that it was listed for $175. That was a little out of my price range. I thought about asking if there was any wiggle room in the price, especially since the piece had been there for more than a year, but this particular store isn’t very amenable to haggling, so I pretty much decided against pursuing the table within a couple of minutes. I headed back upstairs from the lower level of the store with a pretty dejected attitude, but decided to press on and wander through the rest of the space to see if anything else happened to jump out at me. And there she was! 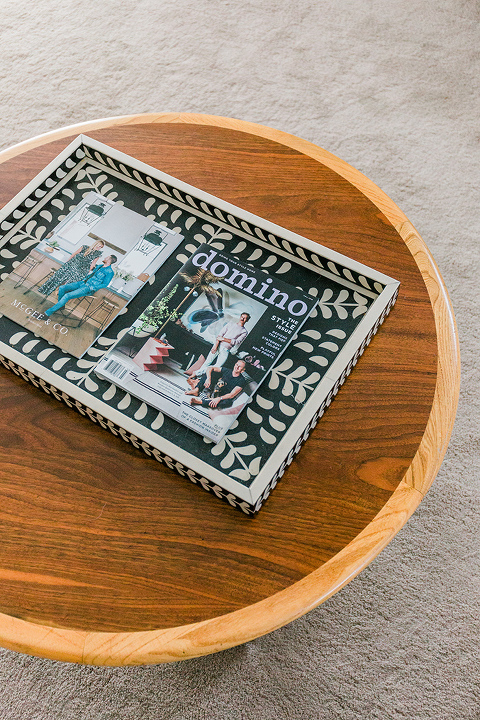 The perfect mid-century round coffee table with an even better silhouette and gorgeous finish. The one I had been considering downstairs had metal legs and a tile top, whereas the second one I found was solid wood and coincidentally stained to match the paneling (which we love) in our family room. I felt like it just had to be too good to be true, but a quick peek at the price tag showed me that it was well within budget—marked $135, down from $165. Sold! Within 10 minutes I had paid for the new coffee table and packed it away in my car destined for the family room. Luckily, it fit perfectly into the blank space left behind by the old ottoman, and it’s now one of our favorite pieces in the house. Even John agrees that it was the right way to go now that he can see it all together. Isn’t the finish just beautiful? It’s a Lane Furniture piece, which is another serendipitous detail in the story because we have a small collection of vintage Lane furniture scattered throughout our house. I especially love the two-tone wood look, and the angular support underneath. I couldn’t be happier with what we ended up getting, and am actually really glad that I had to wait as long as I did to convince John to let me look around for something new because that’s how we ended up with this beauty. Got a Thrift Store Score story of your own to share? Do tell in the comments!